An offensive affair it was at Tucson Arena. In a back-and-forth high scoring battle, the Roadrunners fell just short in a 7-6 loss to the San Diego Gulls Saturday night, coming out on the wrong end of a vivacious opening game of the 2017-18 season. Coming out of the gate hot in front of a boisterous crowd of 5,711, the Roadrunners scored two goals, from the sticks of Emerson Etem and Conor Garland respectively, to take an early 2-0 lead in the opening five minutes of play. Scottsdale native and former Gull Zac Larraza, who had a number of friends and family in attendance, added a marker of his own later in the first. The teams combined for six goals in the opening frame, taking a 3-3 tie into the second period. The Gulls erupted for three additional tallies in the early stages of the middle frame to take a 6-3 lead. Hunter Miska was pulled following the Gulls’ sixth marker of the night; he stopped 12 of the 18 shots he faced. 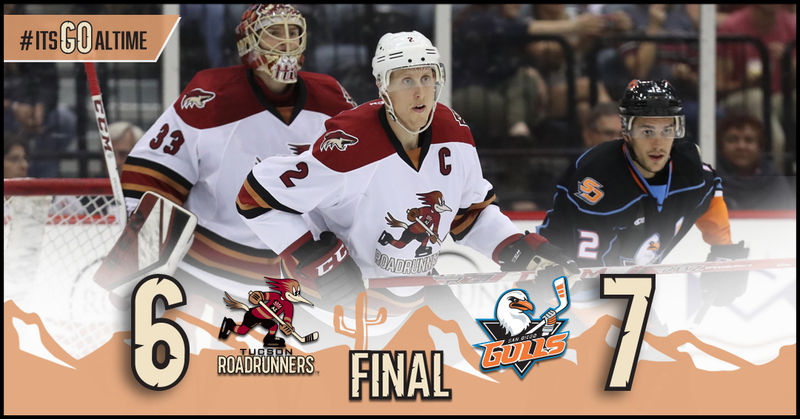 Not going without a fight, Scott Allen and Mario Kempe chipped in with goals of their own late in the second as the Roadrunners tried to stay at pace with a hot San Diego offense. The Gulls took a 7-5 lead into the third period. With 13:21 left to play in regulation, Jens Looke tipped home a Kyle Capobianco shot to get the Roadrunners to within a goal. Despite valiant efforts during the final moments of play, the Roadrunners were unable to get their hands on a game-tying goal, San Diego’s Kevin Boyle making a series of outstanding saves to shut the door as time expired. Adin Hill, in relief of Hunter Miska, stopped eight of the nine shots he faced. All six of the Roadrunners’ goals were scored by different players. 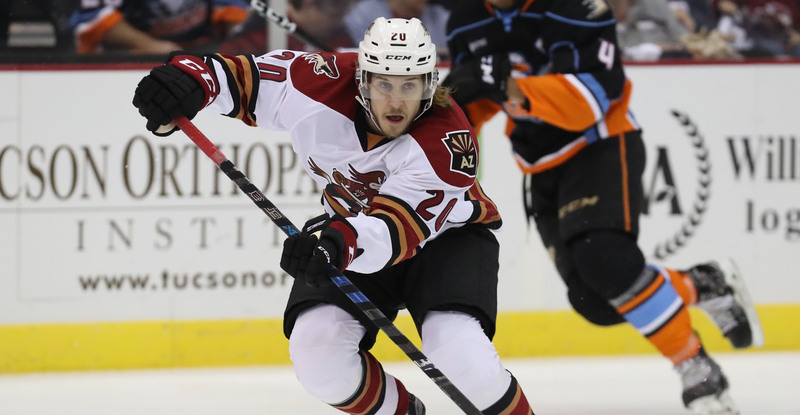 Mario Kempe (1G, 2A) led all Roadrunners players in points scored with three. Emerson Etem (1G, 1A), Scott Allen (1G, 1A), and Trevor Cheek (2A) each registered two points apiece. The team’s next contest is scheduled for Saturday, October 14, when they take on the Bakersfield Condors at Rabobank Arena, where the puck is scheduled to drop just after 7:00 PM.